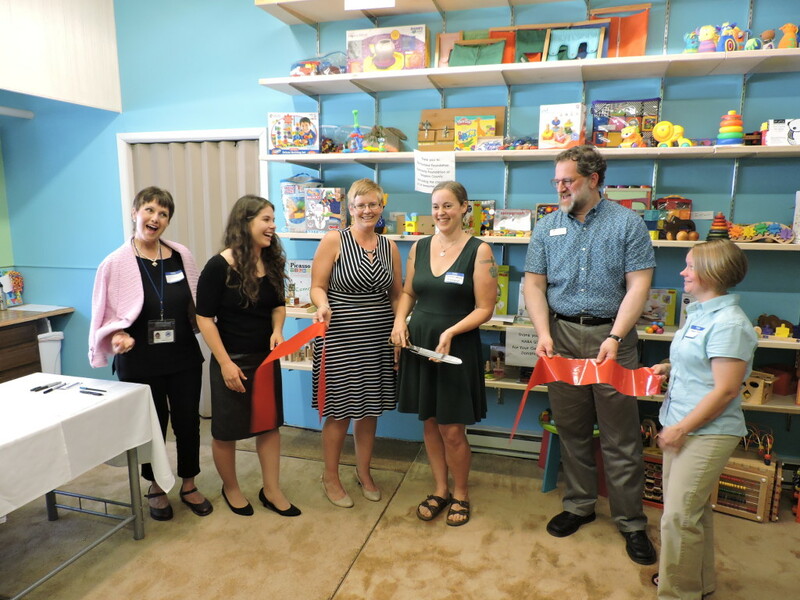 On Thursday June 22nd, 2017, The Tompkins County Chamber of Commerce held a ribbon cutting at Ithaca’s brand new 501(c)(3) nonprofit Finger Lakes Toy Library, which is located in Suite 106 of the Clinton West Plaza. The new Toy Library is operated by a board of four directors, who were there for the ribbon cutting. Business-people, city officials, granting organizations, community members, and many kids ready to play were on hand for the ribbon cutting ceremony. Our community toy lending library on Clinton Street will function for toys and play much in the same way that the public library functions for books and reading. The toy library collection currently consists of over 400 items, most of which have been donated by community members whose children have outgrown them. Toys were also purchased using grant funds, such as eco-education toys thanks to Sustainable Tompkins and literacy-related toys thanks to the Friends of TCPL. Toys available for borrowing will initially be suitable mostly for children under the age of 7, but the toy library will also have an all-ages board game and puzzle collection available from the start. In addition to the lending of toys, FLTL hosts playtimes throughout the greater Ithaca-area. Debra thanked the Howland Foundation and the Community Foundation of Tompkins County, 84 Lumber Company, Danby Hardwoods, Hallagan Woodworking, Warehouse Carpet Outlet, Sustainable Tompkins, Friends of Tompkins County Public Library, HABA USA’s Outlet Store in Skaneateles, Amber Smith: Board Vice President and Volunteer Executive Director, Secretary Alexandra Appel and Treasurer Melissa Thompson, Olivia Hall, Sarah Smith, Molly Petzoldt, Sarah Langley-Sopchak, Tompkins Trust Company, Alternatives Federal Credit Union, Ithaca Agway and True Value, Dryden Mutual Insurance Company, Purity Ice Cream, Life’s so Sweet Chocolates, Miss Angie’s Music, Insero and Co. CPAS, Agava, and Ithaca Bakery. The toy library is ready to sign up members and membership information can be found on the website. Sign up for a membership in person during open hours. For the summer, the toy library will be open on Sunday from 10am-12pm, on Monday from 5:30pm-7:30pm, on Tuesday from 9:30am-11:30am, and on Wednesday from 10am-12pm. Please stop in and become a member soon! They will be closed for the holiday from July 2 – July 4. The mission of FLTL is to improve quality of life by increasing access to toys, supporting play, and encouraging a culture of reuse and sharing. The Finger Lakes Toy Library is an incredible example of the support that businesses, not-for-profits, and community members give to each other as together they support community needs, such as nourishing the development of our children through play with a community toy library.